Creativity Australia’s With One Voice program runs a network of community choirs in Victoria, New South Wales and Queensland. The choirs unite people aged 9 to 90, from all faiths and all walks of life: migrants, people with disabilities, job seekers, executives, seniors, students, refugees, asylum seekers and more. With One Voice choirs are led by professional conductors and meet weekly, followed by supper. Through the Wish List, participants grant one another wishes big and small: such as free music lessons, language tuition and jobs. The choirs help people connect to whatever they need in life: friends, mentors, wellbeing, self-esteem, networks, skills and employment. The With One Voice program has twice been named one of Australia’s top social innovations in Anthill’s Smart 100. 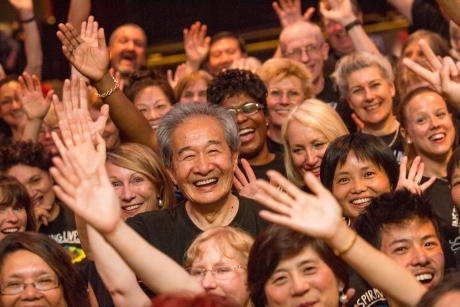 In 2014 the program celebrated five years and, following Founder and Chair Tania de Jong AM’s TED talk ‘How Singing Together Changes The Brain’ Creativity Australia has received enquiries from across the globe. Pilot With One Voice programs are now under development in the USA and Holland. The Conference Gala Dinner will support Creativity Australia’s With One Voice program. Donations received will go towards supporting the participation of disadvantaged people.